The Mentalist Photo Preview: Look Who's Back! Just when it looked like smooth sailing ahead for Patrick Jane and Teresa Lisbon's new romance, an old flame from Patrick's past will make her presence felt this Sunday on The Mentalist. When the CIA finds Erika Flynn in bed with a terrorist they play let's make a deal. They'll give her immunity for her past crimes and let her come back to the States if she helps them capture her terrorist boyfriend and stop a possible attack. Erika's one request...she wants Patrick Jane on her case. The twist? Teresa Lisbon's coming with him. 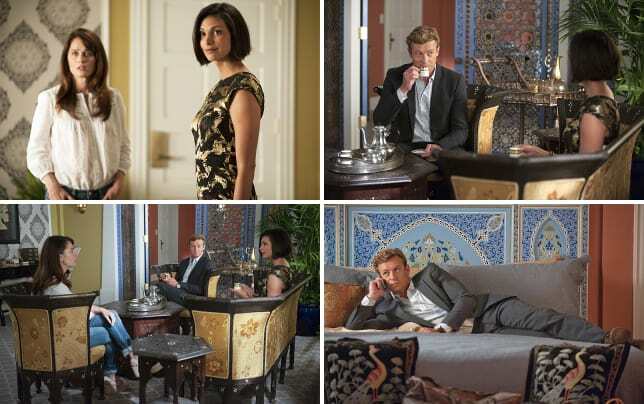 Check out these photos from The Mentalist Season 7 Episode 3, "Orange Blossom Ice Cream," which is scheduled to air Sunday, December 14th on CBS and then return immediately after the installment airs for my detailed recap and review. The Mentalist Photos "Orange Blossom Ice Cream"
You can always watch The Mentalist online here at TV Fanatic. Yon: I've tested others. You're the only one getting everything correct. Jane: I didn't say it was an easy trick. Permalink: I didn't say it was an easy trick. I arrested her, I don't know how I feel about helping her avoid prison. Permalink: I arrested her, I don't know how I feel about helping her avoid prison.